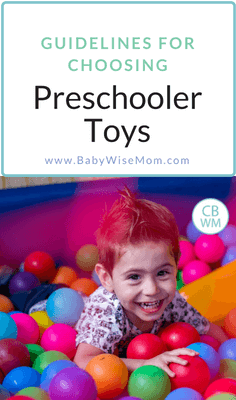 Guidelines for Choosing Preschool Toys. What to consider when deciding what toys to get for your preschooler. 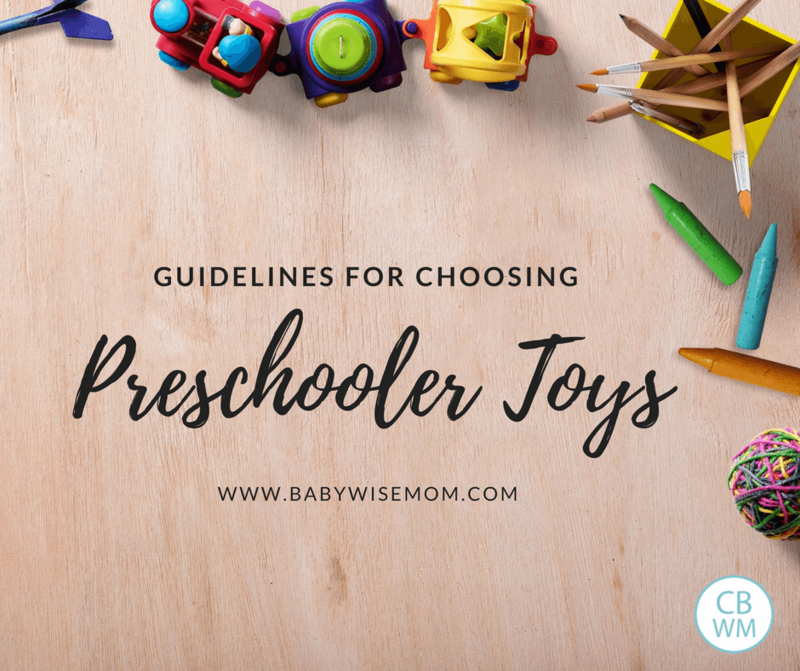 On Becoming Preschoolwise has a section on choosing toys, and I thought this was a great time of year to discuss the list of guidelines. This starts on page 204. Here are some considerations when choosing your toys for preschoolers. A preschooler is super imaginative, so look for toys that will allow for imaginative play. Jenice Hoffman points out that toys that are based on TV or movie characters will not induce much imaginative play. These characters already have an identity and your child will try to recreate that identity while playing. I don’t think you need to cut these toys out completely, but be sure to have plenty of toys that can go where your child’s imagination takes them. Dress up clothes are great for imagination. So are things like doctor kits and kitchen sets. Children this age will also play for hours with something as simple as an empty box. We all have heard (and witnessed I am sure) the stereotype that children like the box the toy came in as much as if not more than the toy itself. My neighbor recently told me about her children’s favorite gift. Her girls are now older elementary, but when they were toddlers and preschoolers, they got a refrigerator box one year. My neighbor and her husband painted the outside and her girls played in it for months and months until the box no longer could stand. My husband has turned several boxes into cars and trains for our children. Brayden loves to get a box and play delivery man for hours. It seems the more simple and more basic the item, the more the imagination is exercised. My plan for toys is that the toy will last through all of my children. Once they are “too old” for the toy, I will then either save it for my future grandchildren to play with or I will donate it. I do not get toys that will not last. We go for toys that can stand the test of time. You want toys that are strong and can be cleaned easily. Choose toys that are appropriate for your child’s age. Follow guidelines on packaging. As Hoffman points out, manufactures put months worth of testing in to determine the right age for a toy. There will definitely be toys your child is ready for earlier than recommended, and even toys your child is not ready for as early as recommended, so of course always use your own parental assessment. One day as a teenager, my sister and I randomly came across some toy commercials. We were a bit shocked. It seemed every toy on the screen was battery operated. Dolls talked and requested things. Trucks honked for themselves. Even as teenagers, we remarked that this was not good and commented on “what was wrong with toys these days.” We remembered when we were kids and we had to cry and honk for our toys. We decided what the toy did, and the possibilities were endless. If you have looked at my toy reviews, you know I am not anti-batteries as a blanket statement. One of the best toys ever made is the LeapFrog Music Table, which would not be so great without batteries. So yes, some toys with batteries are great. But others rob children of imagination. Choose toys your child will like for long play periods and for a long period of time. You don’t want toys your child plays with for a day then puts it on a shelf for months. You want a toy that he will use for months and months to come. A great example of toys with longevity are toys like Duplos. A two year old can stack one on top of the other for hours with perfect satisfaction. A four year old can build simple planes with a complete sense of accomplishment. A good toy can grow with your child. Always consider safety. Chocking hazard? Flame retardant? Safe paint? Get toys that are consistent with your moral values. Giving a child a toy to play with that conflicts with your moral teaching will confuse the child. Exactly where you draw your line is for you to decide. It is good to have some toys that promote team effort or that can be played with as a group. This is great for helping to teach social skills of cooperation, communication, and problem-solving in a group. Brayden is 5.5 and this is the first year that he has ever had an opinion on what he has wanted for Christmas. I have been teaching him to choose toys and save for toys, so he has an ability to think and consider what he really wants. Be careful of advertising and fads from peers when considering toys. Really think it through and make a wise decision for your child. If you are choosing a toy that will last, you want it to be a good choice. I have written several posts to help guide you in choosing toys. I have toy review posts of toys that we have. I have a guide on How I Choose Gifts. And finally, see the toys blog label for all posts on the blog about toys. This is my son's second "real" Christmas. He was only nine months old for his first and got mostly books and teethers. 🙂 Last year I got him some real toys and some of them were a hit and some not so much. This year I'm stressing a bit trying to decide if he really will play with some of the toys I have in mind. I'm thinking of getting him a kitchen because one of his friends has one and he likes to play with it at their house. But I don't know if he will get tired of it if he has it at his own house. There's also this really cool fire house with firetruck that I'm looking at but again I'm not sure if fire trucks are just a fad for him right now. Anyone have any ideas on how to know if the toy will hold your child's interest? Any suggestions would be great! Janelle,Some toys are great because they stand the test of time.We got Brayden a kitchen when he was 18 months and he has loved it since. It is a hit with all of our kids. Kitchens are timeless and are great for multiple ages.Firetrucks are usually timeless with boys, too. I don't think you could go wrong with a fire truck.